Northern Ireland's Steven Davis rues a missed chance. That was a feeling that turned out to be the story of the match. Bosnia and Herzegovina fans show their support in the stands during the UEFA Nations League, League B Group Three match at Windsor Park, Belfast. PRESS ASSOCIATION Photo. Picture date: Saturday September 8, 2018. See PA story SOCCER N Ireland. Photo credit should read: Brian Lawless/PA Wire. Northern Ireland manager Michael O'Neill before the UEFA Nations League, League B Group Three match at Windsor Park, Belfast. PRESS ASSOCIATION Photo. Picture date: Saturday September 8, 2018. See PA story SOCCER N Ireland. Photo credit should read: Brian Lawless/PA Wire. Northern Ireland's Oliver Norwood (right) and Bosnia and Herzegovina's Elvis Saric in action the UEFA Nations League, League B Group Three match at Windsor Park, Belfast. PRESS ASSOCIATION Photo. Picture date: Saturday September 8, 2018. See PA story SOCCER N Ireland. Photo credit should read: Brian Lawless/PA Wire. Northern Ireland players during a minute's applause in memory of the late Jimmy McIlroy before the UEFA Nations League, League B Group Three match at Windsor Park, Belfast. PRESS ASSOCIATION Photo. Picture date: Saturday September 8, 2018. See PA story SOCCER N Ireland. Photo credit should read: Brian Lawless/PA Wire. 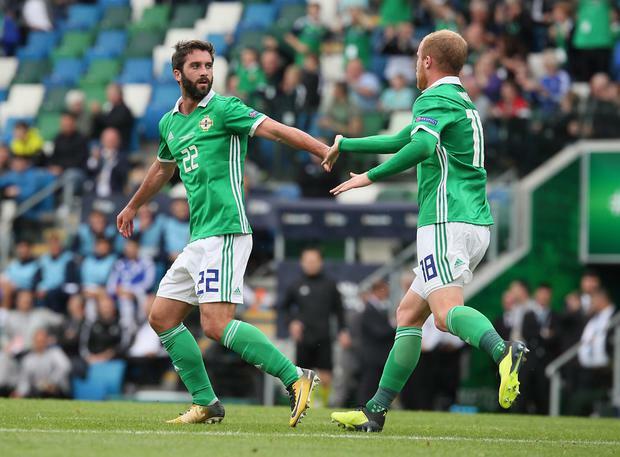 Northern Ireland's Stewart Dallas (right) battles with Bosnia and Herzegovina's Gojko Cimirot during the UEFA Nations League, League B Group Three match at Windsor Park, Belfast. PRESS ASSOCIATION Photo. Picture date: Saturday September 8, 2018. See PA story SOCCER N Ireland. Photo credit should read: Brian Lawless/PA Wire. Northern Ireland goalkeeper Bailey Peacock-Farrell before the UEFA Nations League, League B Group Three match at Windsor Park, Belfast. PRESS ASSOCIATION Photo. Picture date: Saturday September 8, 2018. See PA story SOCCER N Ireland. Photo credit should read: Brian Lawless/PA Wire. A Northern Ireland fan takes his seat in the stands before the UEFA Nations League, League B Group Three match at Windsor Park, Belfast. PRESS ASSOCIATION Photo. Picture date: Saturday September 8, 2018. See PA story SOCCER N Ireland. Photo credit should read: Brian Lawless/PA Wire. Northern Ireland players warming up before the UEFA Nations League, League B Group Three match at Windsor Park, Belfast. PRESS ASSOCIATION Photo. Picture date: Saturday September 8, 2018. See PA story SOCCER N Ireland. Photo credit should read: Brian Lawless/PA Wire. Northern Ireland players warm up before the UEFA Nations League, League B Group Three match at Windsor Park, Belfast. PRESS ASSOCIATION Photo. Picture date: Saturday September 8, 2018. See PA story SOCCER N Ireland. Photo credit should read: Brian Lawless/PA Wire. Northern Ireland fans take their seats in the stands before the UEFA Nations League, League B Group Three match at Windsor Park, Belfast. PRESS ASSOCIATION Photo. Picture date: Saturday September 8, 2018. See PA story SOCCER N Ireland. Photo credit should read: Brian Lawless/PA Wire. Northern Ireland's Kyle Lafferty and team mates training ahead of Saturday's UEFA Nations League match against Bosnia and Herzegovina.